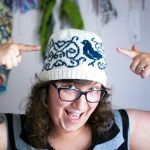 This post has a bit of introduction so that you can understand why this post about being happy belongs on my mostly knitting-related website. If you want to get down to the meat of the post (about the Happiness Project), jump down here. I have been interested in the topic of happiness since I was a teenager. 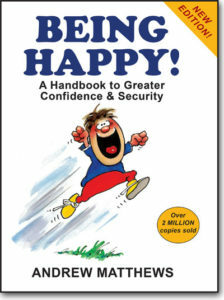 I remember being curious about a book my dad owned, with a little illustrated dude jumping with excitement and “BEING HAPPY” in all caps on the cover. I’m not sure I ever read through the book, but I was always intrigued by the idea that an adult needed help to be happy. I also remember my dad sharing the importance of making life decisions based on happiness rather than social expectations. These were definitely ideas that have had a huge impact on how I live my life. I didn’t realize until my mid-twenties that happiness was something I could work on, almost like a skill. Until then, happiness had always been something you either had or you didn’t, based on things that happened to you. What changed my thinking? I started going to Buddhist meditation classes. One of the things they taught me was that our emotions and reactions are controllable with practice. So we would meditate on joy and holding the feeling of joy. The more I did it, the more I could just bring up the feeling during a regular day when I needed it. It was really cool! 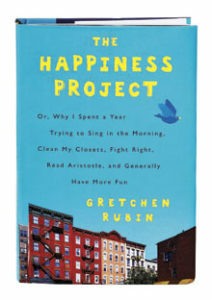 And my latest read, The Happiness Project, is about the author’s quest to become happier when she was already pretty happy. She had a good life and was generally happy, but she knew she could be happier. She decided to work on it, then wrote a book about her individual process (which she notes will definitely be different for everyone). Each month, she created resolutions to stick to for different aspects of her life, like organizing and decluttering for January, and working on her marriage in February. She doesn’t claim the book is a “how to” for becoming happier yourself but just a look into how she did it. She found that reading about other people’s happiness projects gave her ideas for her own, therefore, increasing her happiness! One of my favorite things from the book was the idea of coming up with personal commandments for yourself. You can find hers (and a ton of readers’ in the comments) here. I love the idea of creating this list to remind you of how you want to be and what’s important to you! So I came up with my own, which will hopefully give you some ideas for yourself. Work towards a feeling, not a goal. Everyone is just trying to be happy, cut them slack. You can’t control everything, but you can control how you react. So what are your personal commandments? What are things you tend to forget but when you don’t, lead to a happier or more calm life? I’d love to hear yours in the comments, even if you can only think of one right now. My little Budda…I love your list! Thanks for helping me declutter today! I’m going to keep going by doing a little more each day.